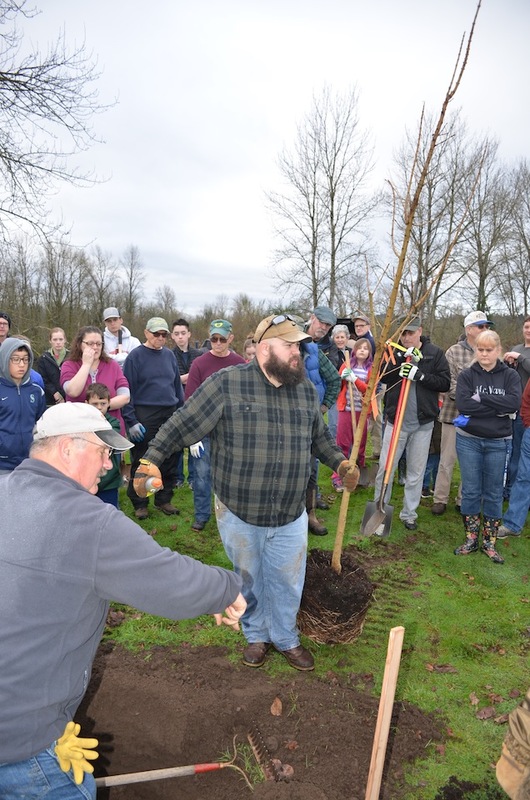 Matt Lawyer assists with tree planting at the Keizer Rotary Arboretum in Keizer Rapids Park. It is Saturday, January 20, the night of the First Citizen and Awards Banquet. Matt Lawyer is in attendance, expecting only to support fellow members of the community and help set it all up. He had no idea that he himself would be honored that night. Even as outgoing Chamber president Nate Bauer began describing the contributions of the recipient of the President’s award, Matt had his mind on others. He found the experience hard to describe. Matt helped distribute meals and fresh blankets and lightened the mood for kids sheltered in the school. After serving in the Navy for just over nine years, Matt returned to Keizer. His work with the Watershed Council highlights his views on personal and community responsibility. Matt then began to get involved with the Keizer Parks Advisory Board where he quickly got involved in discussions about funding. To study for his first meeting, Matt went back and watched the previous two years of meetings. He says that the parks meetings had become pretty routine. An idea would be presented, but funding wasn’t there to back it and solutions were few. The second, bonds and levies could be issued, but that solution was too short-term; the funding provided by them can do great work, but once they’ve dried up you’re back where you started. The third option was to establish a parks fee, which is the route they ended up taking. Or, they could simply do nothing and begin shutting parks down. The parks fee, then, became a massive undertaking for Matt. After countless meetings and handing out surveys with his 12-year-old daughter Baylee, it finally came down to the vote in July of 2017. Matt says the initial public response to the survey results was at first very negative. But that fear quickly turned into a realization about how important the discussion taking place was. He began responding to comments and engaging directly with the public on the details of the plan. It became a learning experience. This is how all public policy should be decided, according to Matt: by listening to the people with an open mind and finding the facts. Only through rigorous and productive discussion and diligent work can honest policy be made. Matt is working on wrapping up the second Keizer Rotary Arboretum Project and recently joined the Keizer Planning Commission. “The planning commission is going into some heavy discussions about the future of Keizer,” he said. Now that the parks will have steadier funding, much of his and other parks board members’ time can be spent making sure parks are kept up and continue to serve their communities. “Keizer is one of those places where I think we do a really good job of taking care of each other as neighbors and do a really good job of trying to make Keizer a great place to be,” he said.